Later this week, I’m sending out electronic ARCs for Blue Sky Days! I’m so excited (and nervous and kinda terrified)! I have several pre-release bloggers lined up to read and review the book, and now it’s time to put together the first blog tour. The tour will start January 17th to coincide with the official launch of the book. The length of time for the tour will depend on the number of people participating – I’m hoping it will last at least two weeks. I know that generally authors approach bloggers about participating in blog tours, and I’m in the process of doing that, but I’m putting out an all-call to bloggers because I’m hoping a few extra people will be interested in joining the tour. For this very first tour, the ARC will be available in PDF format only. There will be future tours with all formats of the ebook available, and eventually there will be a tour with the paperback as well. I know that will limit the number of people who are able to participate in this tour, but since this won’t be the only tour, hopefully the format won’t prevent too many from signing up. If you’re interested in participating but don’t have time to read the book before the tour, or you’re not able to read an ebook in PDF format, I’d be grateful for anything you’re willing to do – guest post, interview, author spotlight, excerpt, etc. Also, if you just want to review the book and not participate in the tour, I'm always looking for reviewers, so if you're interested be sure to contact me! Each person who signs up to participate in the blog will be entered to win a book of their choice (up to $15 Canadian) from The Book Depository (as long as TBD ships to your country). I’m doing this because I won’t have any physical copies of the book to sign and give away, but I want to show my gratitude somehow. If the number of participants exceeds my expectations, I will add a second winner. I'm also hoping to do some swag giveaways, but I'm still working out the details. Also, for every person who participates, I will take a screen shot of their blog and create a photo album on both my blogs, as well as my Facebook fan pages, with links leading back to your blog. I know most of us are always looking for more blog readers and traffic, so hopefully this will help generate some extra traffic to your blog! I’ll also Facebook and Tweet each review, guest post, interview, etc. If you’re interested in hosting a giveaway, I’ll be offering the book in ebook format. You run the giveaway how you want (as in you decide how people enter, how long to run the giveaway, etc), choose the winner, then forward their email address to me and I’ll send them the ebook in the format of their choice. As I mentioned before, I’m also hoping to do some swag giveaways, but there’ll be more about there later. I’ll handle all costs for the giveaways. If you’re willing to host more than one feature (for instance, a review and an interview) do you want to post them the same day, or separate days? If different days, do you care if they’re consecutive days? If you’d like to host a guest post, what topic would you like me to talk about? If you’d like to host an interview, please send questions with your email. 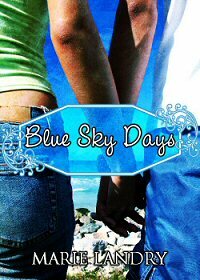 I will be posting updates regularly on the Blue Sky Days Blog Tour page. Once I have the hosts all lined up, I’ll start arranging dates, and will post final dates and participants for everyone to see. I’ll also be creating buttons and banners once I have the dates figured out, so if you sign up, be sure to keep an eye on that page. I am so excited for you! I only wish I wasnt having to wait for Christmas to get my e-reader. I'd love to take a part in this! I emailed you! Wow Marie! Not long to go now, you must be so excited.